Posted on April 26, 2016 | Enter your password to view comments. Posted on April 19, 2016 | Enter your password to view comments. I told Daniel when he gave me his Monotone Satisfiability reduction that the actual problem mentioned in G&J was Monotone 3-Satisfiability. So he went off and did that reduction too. 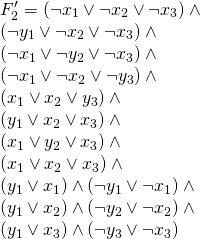 Given an formula of clauses where each clause in contains all negated or non-negated variables, and each clause contains at most variables. Does there exist an assignment of the variables so that is satisfied? this yields a modified clause . and conjunct it onto our old formula producing a new formula . Now repeating this procedure will result in a new formula: . by letting for all and letting for all . Obviously if is satisfiable must be by the above construction of . So by the above claim we have that will satisfy . Continuing from the above, if we have a truth assignment that satisfies , then by the claim above it also must satisfy . And is a sub-formula of so any truth assignment that satisfies must also satisfy . Difficulty: 4, since it’s a little harder than the regular Monotone Sat one. This semester I’m doing an independent study with a student, Daniel Thornton, looking at NP-Complete problems. He came up with a reduction for Monotone Satisfiability, and since I hadn’t gotten to that problem yet, I told him if he wrote it up, I’d post it. So, here it is. Take it away, Daniel! The Problem: Monotone SAT. This is mentioned in problem LO2 in the book. Given an set of clauses where each clause in F contains all negated or non-negated variables, is there an assignment of the variables so that is satisfied? For each we construct two new clauses and , such that all elements of are non-negated literals and all terms in are negated literals with the addition of the new special term . Now let us build a new formula this is our instance of Monotone SAT, clauses are either all non-negated or negated. Notice how we added the extra literal or to each of the clauses or respectfully. Now if there is an assignment that satisfies all of the clauses of then as only or may be satisfied by the appended extra literal, one of the clauses must be satisfied by it’s other literals. 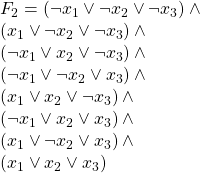 These literals are also in so such an assignment satisfies all . Difficulty: 3. I like that the reduction involves manipulating the formula, instead of applying logical identities. Posted on April 5, 2016 | Enter your password to view comments.